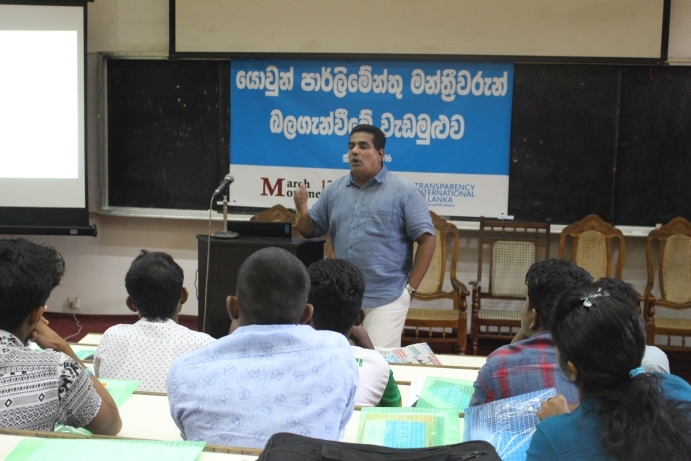 TISL along with March 12 Movement (M12M) have completed training of more than 110 members of Youth Parliament under the National Youth Council during last two months to improve their capacity to fight against corruption using newly adopted mechanisms and tools such as Right to Information (RTI). Five workshops were conducted during last two months to train Youth Parliamentarians. They were given training to identify what is corruption, how its effect the development of the country and forms of corruption. They were later introduced to the existing mechanism to combat corruption. The Youth Parliamentarians were told of newly adopted RTI law and explained how it can be used to improve the social accountability and governance in the state sector. The training was further expand to built the character of each individual MP and were taught on how they should be able to accountable to the country when they represent public institutions in the future.